The next big patch for the strategy title is in the works. The developers have shared a little of what we can expect and it’s looking good. Surviving Mars released earlier this year and it allows you to experience the challenges of colonizing the red planet. It’s a generally fun game that runs pretty well on Linux and I’ve personally sunk in about 30 hours since launch. Liam also seems to have been enjoying it and since release there have been several patches that have addressed some of the shortcomings of the game. The upcoming patch, named Opportunity, will further change the game following the feedback developer Haemimont has gotten from the community. 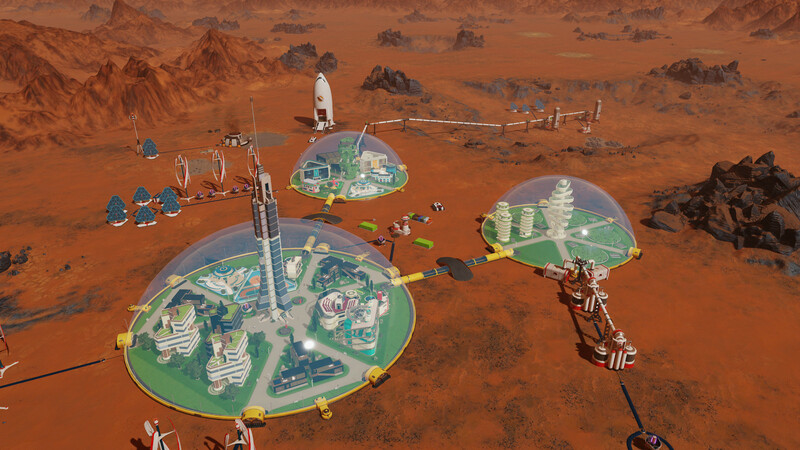 The biggest and most noticeable change is that domes can now be directly connected, allowing colonists to use goods and services as well as go to work in adjacent domes. Previously, the devs wanted ot make players carefully think about what they built in each dome and manage space but it had the result, in my experience, of making true dome specialization impractical. So I’m glad that they’ve changed this part of their game design and it’ll be interesting to see how it plays out. There will be losses in efficiency and output for interconnected domes so it won't be a no-brainer to specialize domes as much as possible either. There will also be new sizes of storage buildings for resources and, more importantly, new late game buildings called workshops that offer an alternative outlet for your colonists. They can now pursue some of the finer vocations in life and work on art and music. It comes with a new milestone for those advanced colonies that have more or less conquered Mars and it shows that leisure isn’t just for Earthlings. The last of the bigger changes is the introduction of game rules. Games will be even more custumizable in the beginning with optional rules that make the game harder or easier, or just outright different. This system takes inspiration from Paradox Development Studios’ title Crusader Kings 2 and it is open for modders to play around with much like the rest of the game. You can read the full developer diary for yourself here. There’s still no release date for this upcoming patch but I can’t wait until it’s out. It’ll be a good excuse for me to jump back into the game. Get a copy of Surviving Mars on GOG, Humble Store, Steam or the Paradox Store. The very mixed reviews seem to hold me back to still wait for a sale. Maybe they will get better when the update is released and I might buy the game instant. That will be interesting. Though, due to the reason I had to spread out the domes anyway due to availibility of resources, I pretty much got used to managing individual domes as just that, just shipping resources between the domes. I often did the mistake of expanding too fast - which is not at all necessary. You need the science to actually be able to expand to further away regions / tiles without killing your resource production on maintenance. I currently hardly find the time to play (at all) - sadly - but I'm sure I'll pick it up one day again. My super-city is yet to be finished .